If you’re thinking about installing a fireplace in your living room but worried about how it might clash with your modern interior then the Toba Eco-Stove may be the answer you’re looking for. Just by looking at its clean minimalist form, it isn’t surprising that this heating system appliance won the iF Product Design Award. The Toba is made by Italian manufacturer MCZ. 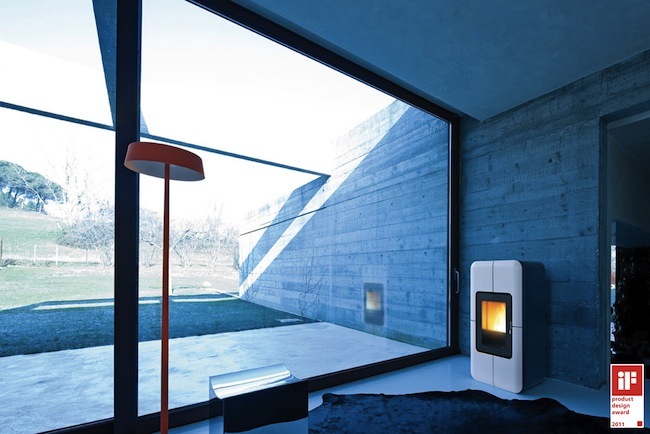 It’s a pellet stove which means that it’s low-maintenance and efficient in heating your home. The green branding refers to the fact that 90% of its component materials are recyclable. One of the notable features of its design is a compact ceramic front that doesn’t have the usual front air vents found in typical stoves. Also central to its appearance is the viewable burn-pot area. The stove, like your TV, comes with a remote control. You don’t have to get up from the warm comfortable couch to manage its power, temperature, and ventilation settings.